Hello! I hope you are enjoying a relaxing weekend. It has been an extremely busy couple of weeks for me and the busy-ness is not likely to stop for a while. I have taken on a new position at work with much more responsibility (it is a temporary role, which I am not ungrateful for). Not much knitting time was to be had, so I am focusing on small things at the moment. I find the ability to finish something does help with lessening stress levels and keep the happiness in knitting. 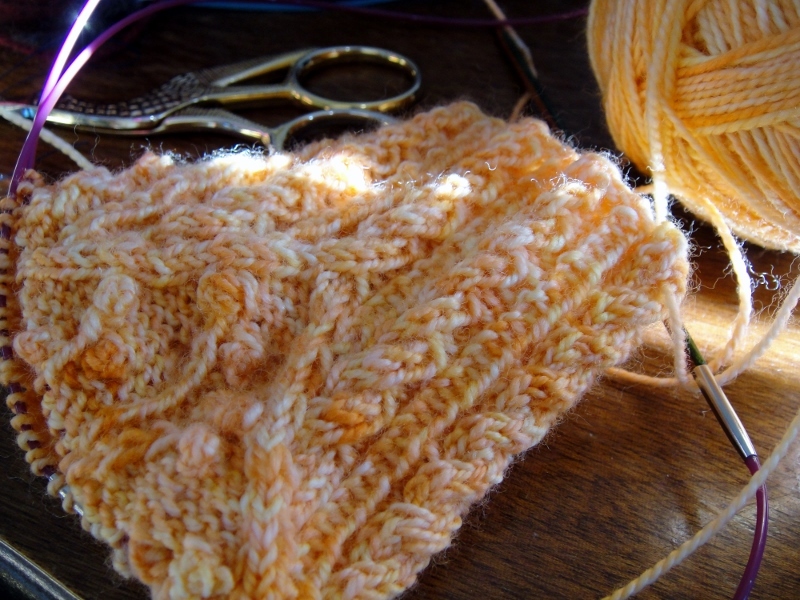 The second lot of things I finished were a couple of pairs of tiny fingerless gloves for my nieces (3 – 5 yrs). I discovered that fingerless gloves for kids are a great way to use up sock yarn scraps! The pattern I used is my Adorable Kids Fingerless Mitts pattern. I have fiddled with the pattern some more, and have updated it – available at the link if you’d like it. This weekend, I decided to put my head down and finish that new sock pattern I have been working on for a few weeks. These are the Train Knitting socks. I started them when I was having to take the train to work. I was getting bored with knitting plain vanilla socks, but needed something that I could still knit without having to refer to a pattern much. I think the little windows in the socks are much like the flashing windows of a train as it travels along the tracks. I will launch this as a new pattern in September to kick-start my contribution to the Socktober festivities happening over on the Carolina Fiber Girls’ podcast (the short answer is that I’m going to have a 40% discount on all my sock patterns from 15 September – 31 October). 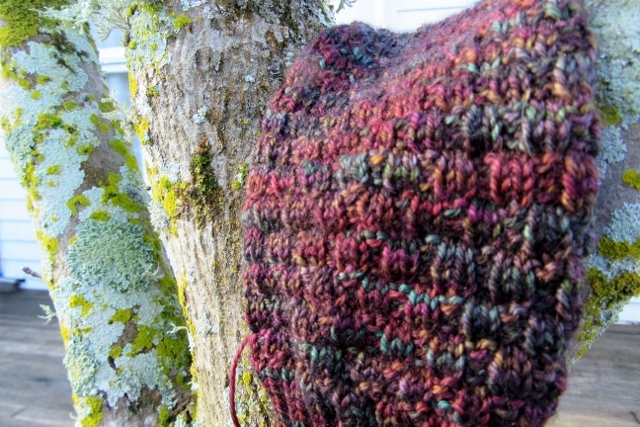 The yarn is Meraki Studio‘s sock base in a very pretty colourway called Tip Toeing Fairies. I have used deep stash for this week’s new projects. The grey alpaca/polwarth blend is from the South Island by a producer who no longer makes their own yarn. It is on its way to becoming a Braidsmaid. The socks are two part-balls that I decided to combine into a sock with contrasting heels, toe and cuff. 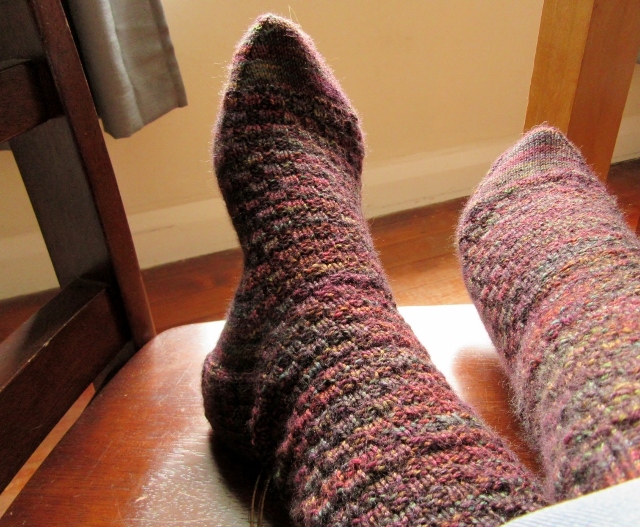 I haven’t actually knit a pair of socks like this before, but am loving how the two colourways are working together. The yarn is the work of the lovely James, who sadly no longer dyes. I do so miss it. Some of the prettiness that is showing up in my garden – Spring is not far away, although it feels like winter has only just started. I am looking forward to seeing the apple, plum and peach trees burst into blossom. Categories: Knitting | Tags: Adorable kids fingerless mitts, FO, free pattern, Knitting, Maniototo Wool, Meraki Studio, sock yarn, Wool | Permalink. Long time readers of this blog will be aware of the free pattern collection I developed to highlight the importance of looking after our oceans: Sustain the Sea. I have been absolutely thrilled to be joined in this initiative by Kiwi designers Mary-Anne Mace (Biophilia – pictured above) and Sonya Newstead (Empty Nets – pictured above). Today, I’m honoured that we are joined by a wonderfully talented young designer, Josiah Bain, who hails from the United States of America. It is truly exciting that this is developing into an international statement about our oceans, and that there are so many designers who are like-minded! Josiah wrote to me recently offering to donate a pair of socks to this initiative: Gyre. A gyre is a system of currents in the ocean that spirals around a central point. The gyre that these socks are named after is the North Pacific Gyre, the largest ecosystem on Earth. As well as being home to different marine creatures, the North Pacific Gyre is home to the Great Pacific Garbage Patch. He offers it here in the hopes that “awareness will be raised about the harmful practices and dreadful littering happening in our naturally splended oceans”. This is a beautiful pattern that harmonises completely with the theme behind the socks. The socks are also very interestingly constructed. Please visit Josiah’s thoughtful blog post to read more about these socks, to download a free copy of the pattern and to find out about a very easy thing that all of us can do to contribute to the ocean’s health. And who is his great model? Find that out too when you visit his blog! Thank you, Josiah, for this beautiful pattern, and importantly, for your own commitment to sustaining the sea! Categories: Free patterns, Socks, Sustain the Sea | Tags: FO, free pattern, Josiah Bain, Knitting, lace, socks, Sustain the Sea | Permalink. Today, Zealana released a free pattern in time for the holidays. It is designed by me! I am super happy with how it has been photographed and styled – what a stunning model and location! The pattern is available for download from Zealana’s website page – visit their Facebook page for the link, or if you don’t have Facebook, download it from their website here. The colourwork in this hat is a slipped stitch pattern, popularised by Barbara Walker as mosaic knitting. Mosaic knitting is easy to knit and faster than traditional stranded colourwork because only one strand of yarn is used in each round. The double-sided band makes for extra warmth around the ears. It is finished with a stylish pompom. This hat is worked in the round. 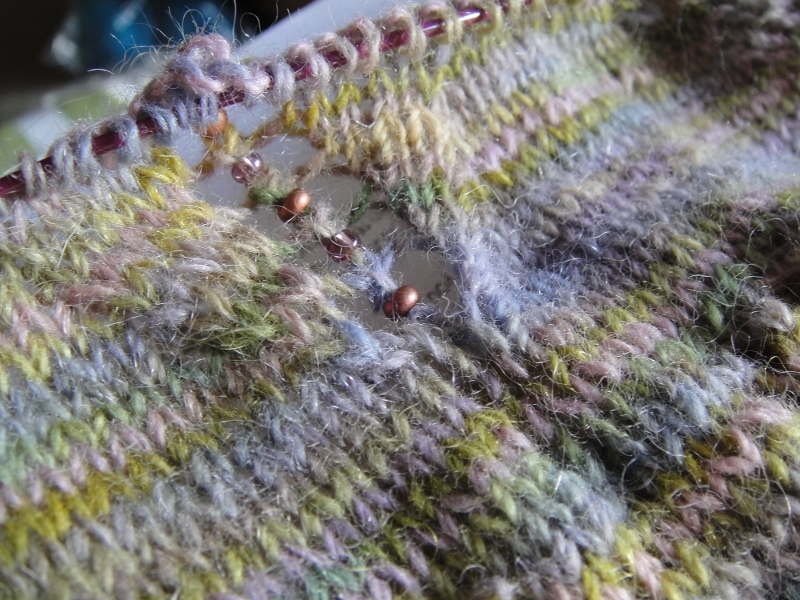 When working the slipped stitches, the working yarn is always stranded across the wrong side of the work. Remember to keep the floats loose by spacing the slipped stitches. There is no need to break the yarn between color changes. The hat uses Zealana Cozi in the Bittersweet and Custard colourways. Materials needed are 2 balls of Bittersweet and 1 ball of Custard. 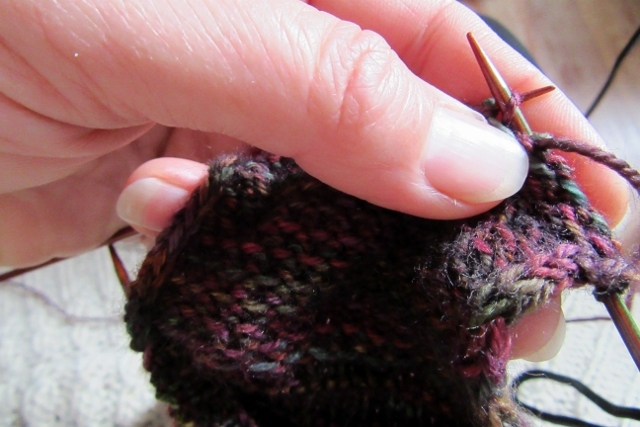 You also need 2.75mm and 3.25mm circular needles, stitch markers and a pom pom maker. Hat is 21” / 54 cm around the band and 9.5” / 24cm tall excluding the pompom. Fits the average adult head and allows a moderate amount of slouch. Categories: Designing, Finished Objects, Free patterns, hats | Tags: colorwork, free pattern, hat, Knitting, pompom, stranded knitting, Wool, Zealana | Permalink. 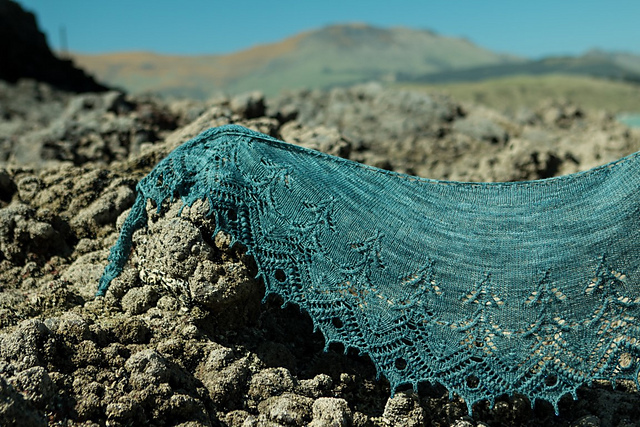 Today, Mary-Anne Mace, New Zealand lace designer extraordinaire, released Biophilia. “Biophilia is a term first used by psychologist Erich Fromm, and developed by biologist E. O Wilson to describe a hypothetically innate human tendency to feel an emotional attachment to the natural world. Regardless of whether the tendency for biophilia exists or not, human dependence upon the natural world and its complex ecosystems is a fundamental truth. The idea that human wellbeing is utterly dependent upon our positive interactions with the natural world and its biological diversity makes conservation of the planet’s ecological systems imperative. This decades old theory is even more relevant today as we continue to transform the planet in our quest for perpetual economic growth. 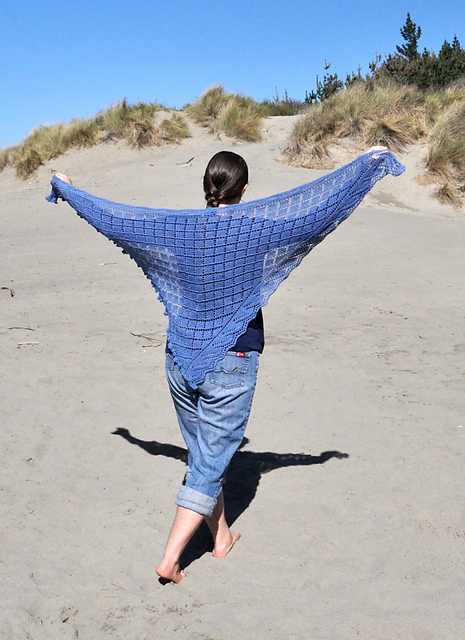 This shawl, Biophilia is a part of the Sustain the Sea collection. It is a free pattern, and yet it is not free. I ask that you consider your relationship with the natural world around you, and how your activities impact upon it. Is there something you can do to reverse environmental degradation from your home, in your community? I ask that you actively do something, and continue to do something that benefits the environment. To be effective, conservation and protection of the Earth’s resources and ecosystems must be adopted in the home, and then spread outwards through workplaces, schools, boardrooms, and government departments via policy makers, educators, parents, conservationists, writers, idealists, you and me. From the home to the sea – while environmental degradation may seem an insurmountable by-product of human activity – together we are many. Together we are so many, many people – ourselves a huge, diverse, and imaginative repository of information, solutions and actions that can benefit the environment, our relationship to it, and ultimately our own wellbeing. 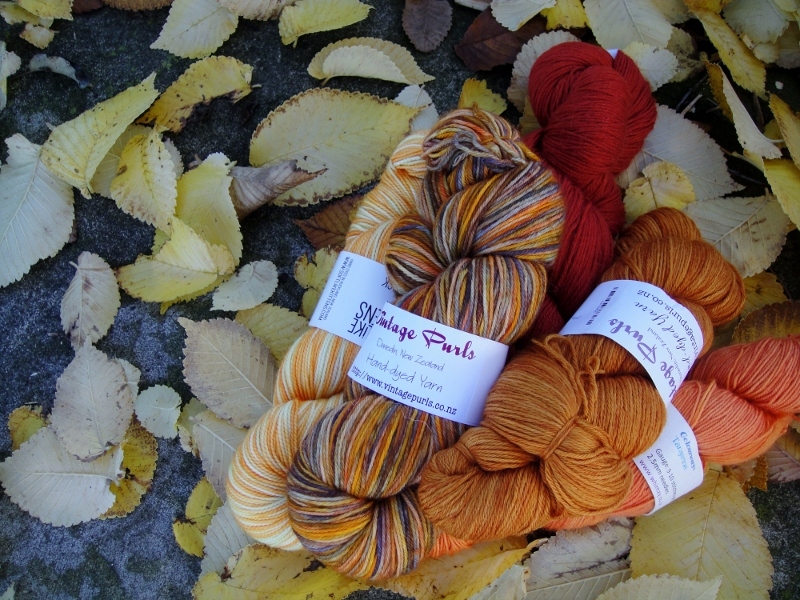 I’m sure you will agree that Biophilia is a stunningly beautiful shawl. Mary-Anne has very eloquently expressed much of what I feel, and now I have a name to put to it: Biophilia! I’ll be casting on for this shawl very soon. Join me! Download the pattern on Ravelry – link here. 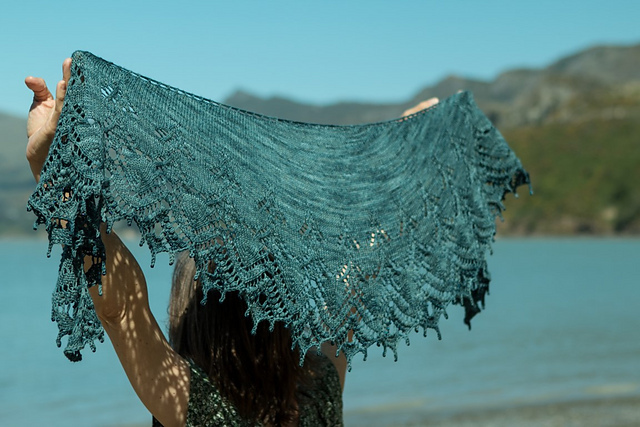 Categories: Free patterns, lace, Sustain the Sea | Tags: free pattern, Knitting, lace, Mary-Anne Mace, nature, shawl, Sustain the Sea, sustainability, Wool | Permalink. I love to make beautiful fabric. The feel of the yarn as it threads through fingers and around needles. The enjoyment of seeing a beautiful thing coming out of what was once (very pretty) wool string. The excitement of seeing a concept become reality! 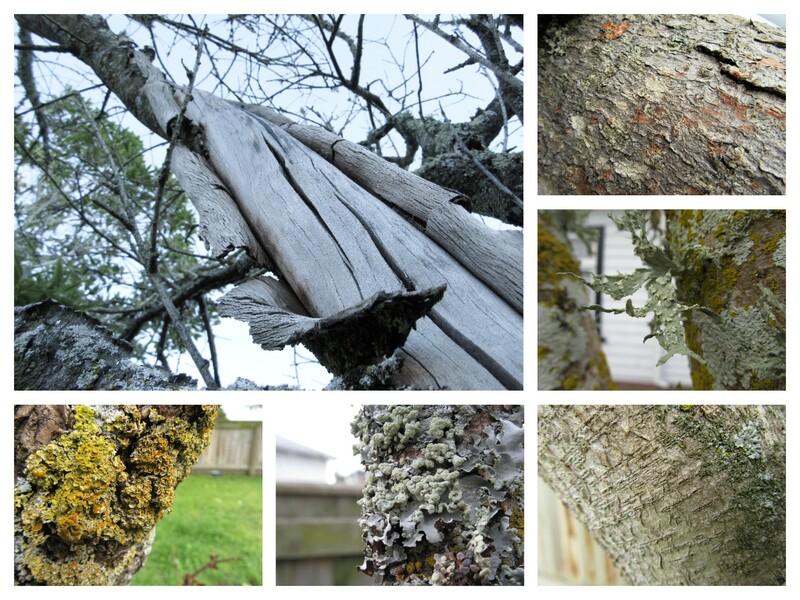 I’ve been looking at a lot of texture in nature lately. Bark and the things that grow on bark have been particularly fascinating. They have inspired and motivated. These are the first design in my nature series. I have used Tanis Fibre Arts’ Blue Label (80% wool, 20% nylon) in the Tartan colourway. It is, I think, perfectly matched to the inspiration, where you can see many colours that harmoniously blend on the bark of a tree. This is an easy pattern, designed for knitters who want an interesting sock to knit without having to concentrate too much. This pattern suits any standard weight sock yarn. The stitch pattern is in multiples of four, which means that it can be easily adapted for non-standard sock yarn weights or other sizing by the addition or subtraction of stitches. Sizing is provided for an adult small, medium or large size. You need approximately 320m of yarn for the medium size. I’m making the first of these designs free, in celebration of the free joy that nature gives us. Download here. I plan to release three designs in all. Categories: Designing, Finished Objects, Free patterns | Tags: Bark, FO, free pattern, inspiration, Knitting, nature, socks, Wool | Permalink. I went into the garden this weekend and found a beautiful carpet of yellow leaves covering the ground. I have missed taking pictures of the beautiful autumn leaf colours I have been seeing – most of the trees have now dropped their leaves, or are past the blaze of colour that they were. 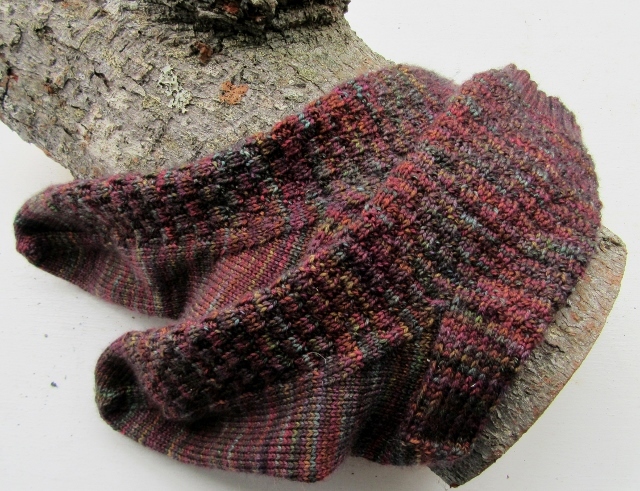 I have finished the BFF socks, so they got some leaf footage as well. 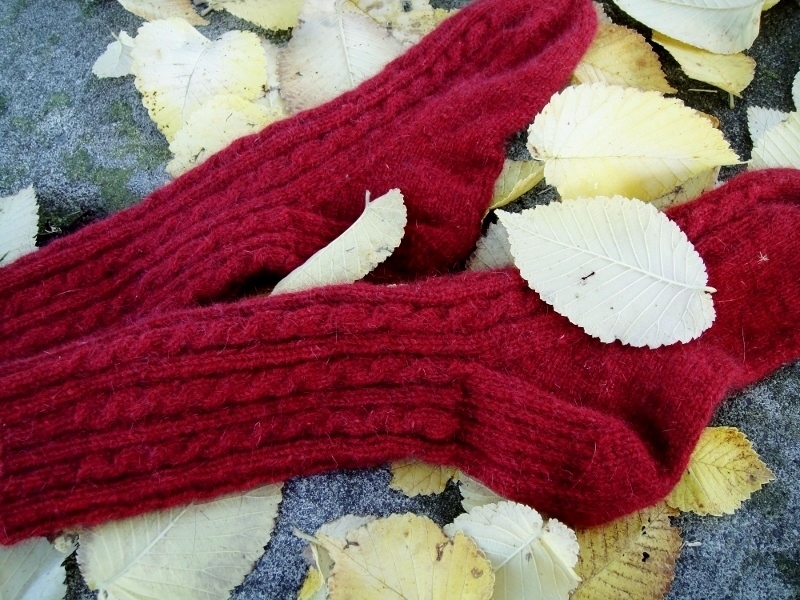 They are lovely and fluffy and will be warm and cosy on the recipient. I do not know what the white stuff is on the socks – it is certainly not there in real life. I think the light must have been illuminating the fine possum fibres and showing them up as white. 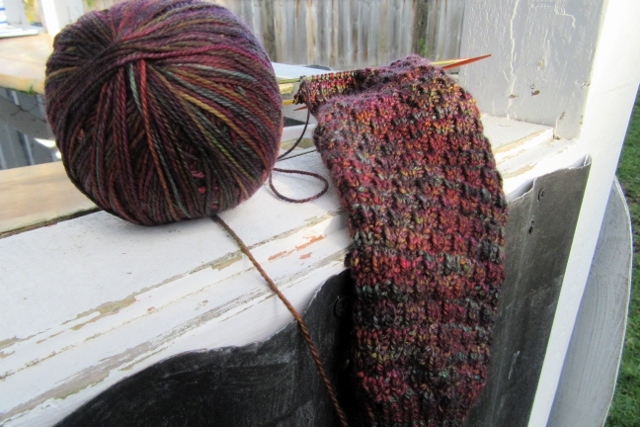 Seems like autumn is a theme on the needles as well, if this other sock project is anything to go on. I am not overly happy with how these socks are turning out. I think I am using the wrong yarn for the bobbles to show nicely. Some frogging and restarting with new yarn may be in the works. This is not a pleasant prospect given how involved this pattern is and the fact that I have now knit an entire leg. Better to get it right than have an unhappy completion though. A number of other projects are keeping me busy. I’m also knitting Hybrid Vigour using a beautiful ball of Anna Gatton’s merino/mohair in the Lavender Fields colourway. I do so love the loveliness of Anna’s colourways. The construction of the pattern is very interesting and I am enjoying combining a New Zealand designer with New Zealand yarn! I have also started my June project. It is just how I hoped it would look! A medical emergency with the young boy today meant that I missed all the daylight hours to take photos, so you’ll have to wait until next week to see it. 🙂 The boy is fine after a couple of hours in hospital on a nebuliser (he has come down with bronchitis, which triggered an asthma attack. The nebuliser delivers a high dosage of ventolin to relieve asthma). And finally, I have a gorgeous pattern to show you today, a new release by another Kiwi designer, Sonya Newstead of StringHerder Designs. Sonya has very generously contributed Empty Nets as a free pattern for the Sustain the Sea initiative. Thank you Sonya! The pattern is superb! Read her story and download the pattern here. Categories: Finished Objects, Free patterns, Inspiration, shawls, Sustain the Sea | Tags: BFF socks, free pattern, Knitting, shawl, sock yarn, Sustain the Sea, Wool | Permalink.